His great grand father Joseph Orderson was a Barbadian who felt oppressed by the colonial regime in Barbados and left the Caribbean island to live in the South African nation of Soweto. 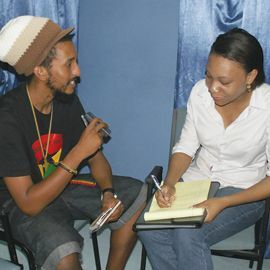 The award winning independent filmmaker who was documenting his journey in Barbados for two weeks, however took the opportunity to conduct a film workshop on Thursday October 5 at the Peace Memorial Hall, in St Vincent and the Grenadines upon invitation from local representative of the Global African Congress Andre Liverpool. The 24-year-old who is also a television producer/director for childrenâs news, which airs on the South Africa Broadcasting Corporation, considers himself firstly a cultural activist who uses film as a medium to get his messages across. a working class family where he is the only boy of four sisters and his mother is a seamstress while his father is a screen printer. He said that coming from such humble upbringing motivates him to use film as a weapon for social change and he has formed his multi-media company called Ziontrain Productions which he hopes to expand. Oderson said that he couldnât wait to complete his film where he shows the paternal connection of his Afro-Caribbean root and describes the film as a puzzle yet to be made whole. The young filmmaker who shared his story with participants at the film-making workshop encouraged those who wished to pursue film to take up the challenge and to let their creativity flow. In appreciation for his visit Orderson was given the book âSt Vincent and the Grenadines – A National Treasureâ by Dr Edgar Adams.